From movies he enjoys to his loved family, Billie Joe’s arms have transformed into an art gallery over the years. 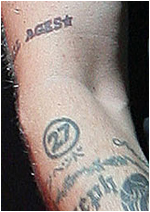 From receiving his first tattoos in Europe all the way until now his collection seems to grow. Below you will find a list, organized by limbs, of his many, many, many tattoos. 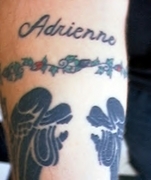 Among the many designs and illustrations decorating Billie Joe's right arm is his tattoo of Adrienne's name with a vine winding underneath it. Below those, you would find the Jesus Christ Superstar logo. Jesus Christ Superstar was a popular movie. It is a rock opera and was nominated for an Academy Award. The Japanese symbol for pot can also be frequently seen on his arm sending positive messages to the youth of America!In addiction to that Japanese writting, he also has pinhead on his arm as well. The 27 in a circle is The Riverdales logo. The Riverdales are a punk band signed on Lookout! Records. 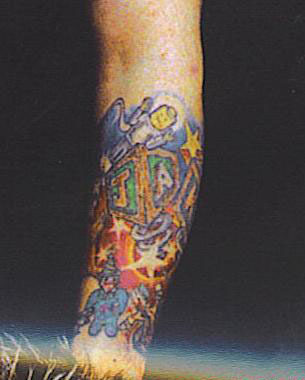 Billie Joe helped manage the band's debut album, which came out in June of 1995; around the same time he got the tattoo. 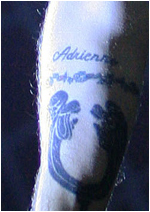 In addition to the tattoos mentioned above you can also find a black heart and a butterfly. 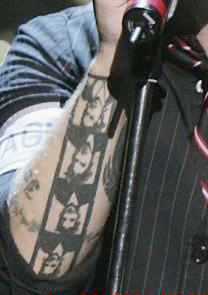 He also has the all ages fanclub logo on this arm.A more recent tattoo of Billie Joe's is a design consisting of intertwining vines. It also showcases a rose above his son Joseph's name. Due to this tattoo being so large, it has covered up several tattoos mentioned above. 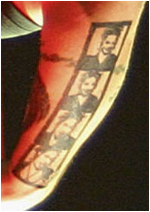 Last, but certainly not least is the filmstrip showcasing pictures of his wife, Adrienne. 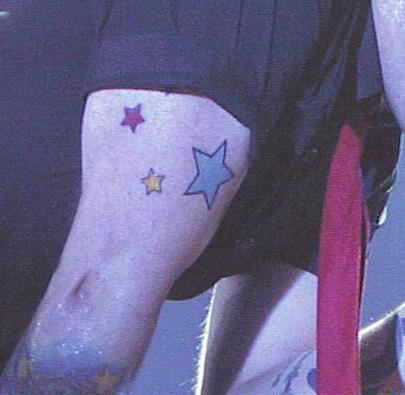 Billie Joe's left arm may have a slightly smaller number of tattoos, but they tend to be larger, so it all evens out. The East Bay punk scene is probably one of the most influential factors in Green Day's music. As a joke between the members of the band the formed a "mafia" all getting tattoos for their "East Bay Punk Mafia". However, it is also rumored that EBPM stands for East Bay Pop Mafia, and is a twist on the Twin Cities Pop Mafia which was formed by the band Dillenger Four.Billie Joe's son's name, Jakob, is in block-style letters with random objects surrounding it, giving it a cartoonish feel. Another factor that gives his left arm the cartoon vibe is a baby smoking a cigar, which many people would be familiar with as Baby Herman, from Who Framed Roger Rabbit. You can also find a "bracelet" of clowns interlocking hands. A recent addition to this arm is a tiger found under his shirt sleeve. He also has several stars on the upper part of his left arm. 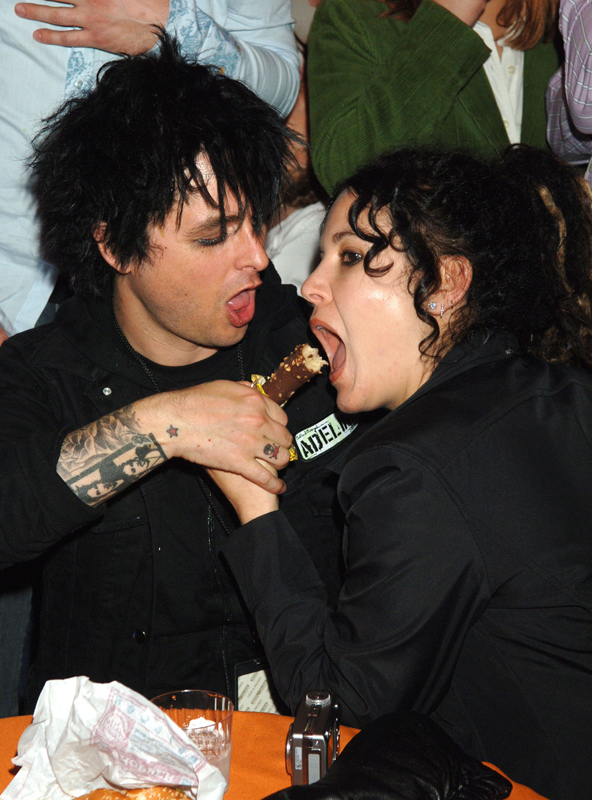 Adrienne Armstrong has diffidently taken the prize for inspiring the largest number of Billie Joe's tattoos. 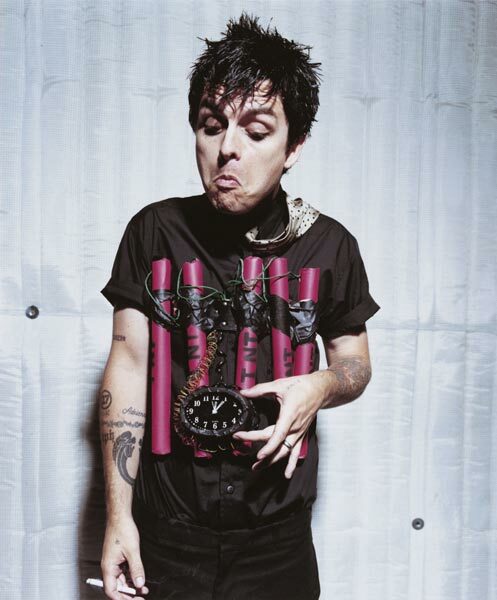 Along with the tattoos mentioned above, you can also find the number 80 on Billie Joe's waist, a nickname for Adrienne and also the title of a song about her. Adjacent to his 80 tattoo, you will find the word "punx" on his waist as well. 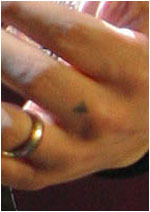 Both of those tattoos he gave to himself.His left hand is home to a flower, a black heart, and the word "punx". 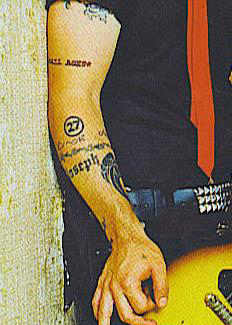 His right hand showcases the logo of Adeline, Billie Joe's record label. A cross with lights beaming from it and a red star can be found on his right hand as well. On his chest two cars and a skull can be seen along with some type of flower. Before those tattoos were on his chest, he had something that resembled a mushroom, which is the potent male symbol. Right above this he also had the word "Zeke".On his leg you can also find the CM logo, and around his ankle he has the word "IDIOT".